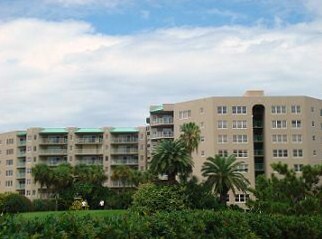 The Cloverleaf South is a gated golf course community located just across from the beach. Within walking distance to the Atlantic Ocean, Cloverleaf South offers residents a laid-back lifestyle in a building with lots of great amenities including a par-3 golf course, several pools, fitness center, and club room. This self-contained condo comes with lush landscaping surrounding the entire complex. Most units provide river, ocean and golf course views. Homebuyers can choose between 2 and 3 bedroom floor plans, and for a lucky few, a penthouse. Each unit has a designated parking spot directly outside of their unit. This is possible due to the spiraling parking garage that allows easy access to your vehicle when bringing in belongings or groceries. The Cloverleaf South come with all the amenities you would expect with some of the area's most sought after buildings: beautiful landscaping, outdoor pools, an indoor pool, workout room, sauna, and spa. Nearby facilities include a 13-hole golf course and tennis courts. In addition, homebuyers are just steps to Publix, Walgreens, banks and restaurants!